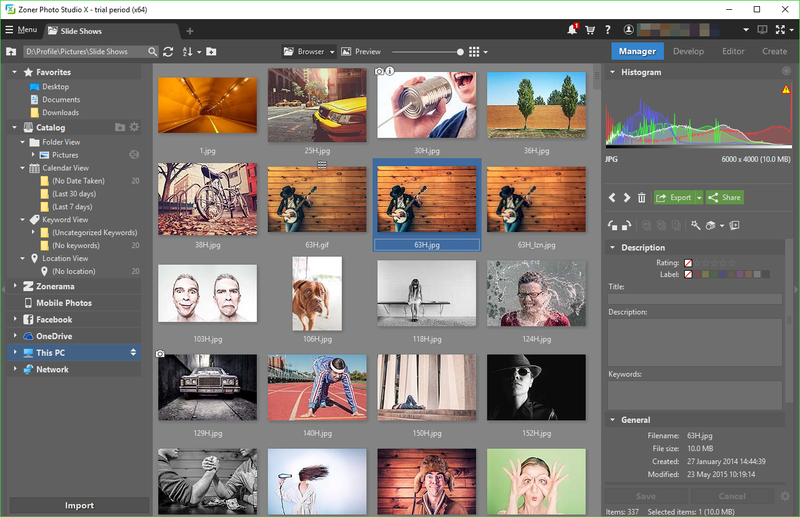 Zoner Photo Studio X is a powerful tool for organising, browsing and editing your digital photos. A capable photo manager can import images from your camera, acquire them from a scanner, extract the pictures from a PDF, find the JPEGs in almost any file type, or take images of your desktop with its built-in screen capture tool. Photos can be automatically sorted by date, place and keywords to save you time. Alternatively, you can batch assign descriptions, keywords and more, use the batch renaming tool, and have the program back up the entire collection when you're done. The editing tools are just as impressive. There are one-click filters and fixes, a host of colour and lighting adjustments, some excellent image transforms, a few drawing options and a good selection of effects. Even the simplest of tools offers plenty of control. The Resize tool gives you 8 algorithms to choose from, for instance, and has an optional Sharpening step to keep your image crisp. Elsewhere, the Develop module enables non-destructive processing of RAW and other photos with dozens of filters and tools. The program has a pile of extras, including watermarking tools, metadata editing, geotagging via Google Maps, batch processing, a duplicate file finder, panorama and HDR creators. And once you've finished, there are tools to create slideshows, build web galleries, send pictures via email, to FTP servers, or upload them directly to Facebook, Twitter and more. Zoner Photo Studio X has a wide range of highly-configurable features. It's more for the experienced home user than professionals, but if you're looking to move up from more basic editors - and can live with the relatively high price - it could be a good choice.